So many parents I know use the Time-Out theory (I'm one of them) but I recently came across an article that had the theory that Time-INS should be used instead of Time Outs, so naturally I had to find out more! 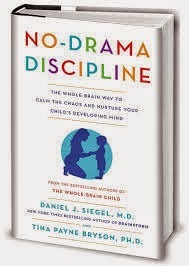 Daniel J. Siegel and Tina Payne Bryson launched their new book No-Drama Discipline which is based on the theory that when a child is misbehaving, what they need is more attention not less, hence the Time-In. They believe that the negative behaviours are the child's way of trying to express that they want attention. By giving them a time-out, this can apparently be quite harmful to the child as it is giving them the opposite of what they need. The article I read stated that research has been done into how time-outs affect children using brain scans. It's been found that time-outs can cause 'relational pain' which is caused by the isolation during punishment. On the scans this looks the same as those who have received physical abuse by their parents, which I found shocking! And apparently by repeating these time-outs over time, it can cause a change in the structure of the brain. Time-outs basically teach a child that when they do something wrong or make a mistake, they have to be by themselves. Children can see this as rejection, as they can feel that their parents only want to be around them when they are 'good'. No-Drama Discipline gives practical strategies in how to work with children in ways that won't have these negative physical and emotional effects on the child, which is why I made sure I got a copy of it as soon as it came out! A lot of the techniques come from the Mindfulness theories which I am currently researching as it is pretty impressive stuff. Mindfulness is basically a way to constantly be present in the now (so not on your phone tweeting, or your mind wandering while you are driving)- you are noticing every sound, smell, sight, touch of what is happening right in that second. It is a very complicated theory which takes a lot of practice and meditation, but so many health professionals refer patients to this now for both mental and physical health issues. The book aims to help parents use better ways to challenge misbehaviour, but it also helps you to find ways to build your child's emotional and social skills which I'm a strong believer in doing! I was sent a copy of this book to read for the purpose of this review. No payment was received and all opinions are honest and my own.